(by Phil Stewart, Reuters) WASHINGTON — A Chinese warship has seized an underwater drone deployed by a U.S. oceanographic vessel in international waters* in the South China Sea, triggering a formal diplomatic protest and a demand for its return, U.S. officials told Reuters on Friday. “The UUV was lawfully conducting a military survey in the [international] waters of the South China Sea,” one official said, speaking on condition of anonymity. “It’s a sovereign immune vessel, clearly marked in English not to be removed from the water – that it was U.S. property,” the official said. Still, the Pentagon viewed China’s seizure seriously since it had effectively taken U.S. military property. The seizure by the Chinese Navy will add to concerns about China’s growing military presence and aggressive posture in the disputed South China Sea, including its militarization of maritime outposts. A U.S. think tank last week said new satellite imagery indicated China has installed weapons, including anti-aircraft and anti-missile systems, on all seven artificial islands it has built in the South China Sea. 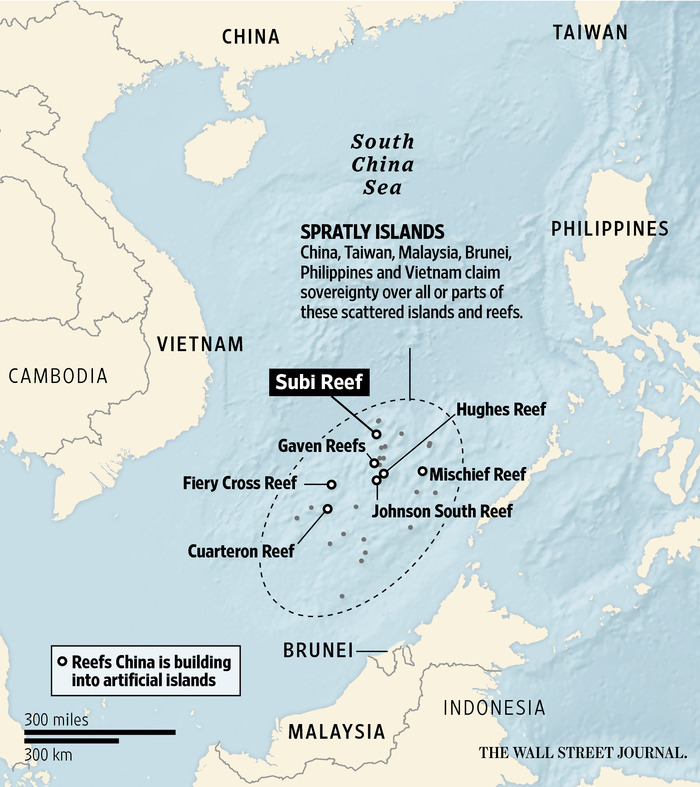 2015 Wall Street Journal map depicting the area in the South China Sea where China has built artificial islands installed weapons, including anti-aircraft and anti-missile systems. “This move…is highly escalatory, and it is hard to see how Beijing will justify it legally,” Rapp-Hooper said.